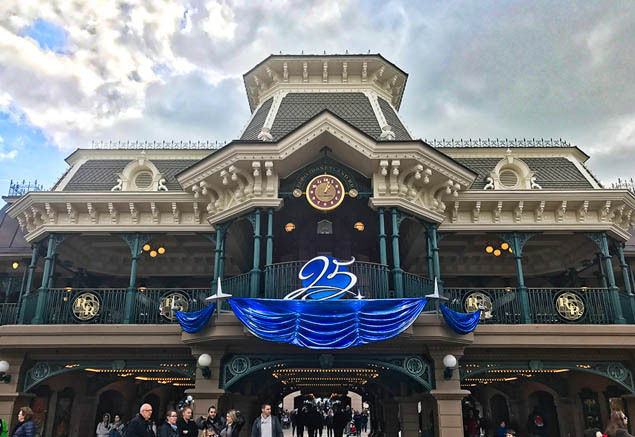 This year marks the 25th anniversary of Disneyland Paris and, in true Disney style, they are pulling out all the stops for an epic celebration. April 12, 1992 marked the day Disneyland Paris first opened its gates to visitors and, today, the park is undergoing new enhancements and additions that will provide exciting new attractions for years to come. There is a brand new parade at Disneyland Paris for the 25th anniversary. Look for spectacular new floats, especially the fire-breathing dragon. This is the first full-length new parade for Disneyland Paris since the 15th Anniversary. The new 3D attraction mirrors the Star Wars attractions at other Disney Parks with over 70 different mission combinations. The new Star Tours: The Adventures Continue takes guests on a 3D journey to the planets of Jakku, Hoth, Tatooine, and more, and includes scenes from the latest movie, Star Wars: The Force Awakens. Disneyland Paris has the most unique Space Mountain attraction, as it’s the only one that actually goes upside down! A true E-ticket ride compared to the Space Mountain you likely grew up with at either Disneyland or Walt Disney World. Now, the Rebel Alliance takes over Space Mountain: Mission, with all new special effects turning it into a Star Wars thrill ride. If you’ve seen the Disney Dreams! show, you’ll love the new Disney Illuminations. Enjoy as Sleeping Beauty’s castle is illuminated by light projections, special effects, and fireworks in this one-of-a-kind nighttime spectacular. The new Disney Illuminations features Mickey Mouse as its host and includes scenes from Pirates of the Caribbean, the new Beauty and the Beast movie, and Frozen. Bring your little ones to the Royal Castle Stage where you can join the famous Disney princesses for a majestic ball in celebration of Disneyland Paris’ 25th anniversary. Look for princesses like Cinderella, Aurora, Belle, and Snow White to make daily appearances. Join Mickey Mouse and some of your favorite Disney characters for the new Mickey Mouse Anniversary Show. Mickey is sporting a brand new costume, and dances along with a new 25th anniversary song. Disneyland Paris has been undergoing a major facelift as many decorative elements have been fixed around the resort, while attractions undergo refurbishment and enhancements. New attractions, like Ratatouille, have been a welcome addition to Walt Disney Studios. And, that was just the beginning as Disneyland Paris recently announced its 10-year investment plan for the resort, which includes new Marvel themed attractions and shows at Walt Disney Studios.